La Basilica with my mentos. Here’s a photo of me with my mentos at la basilica in the Old City of Quito. From left to right: Tom, Katie, Sarah, Claire and of course you know who the tiny one is all the way on the right! Spending the morning packing and catching up on some reading I need to do and maybe, if I get a chance, going to go to the park and check out the gardens. Heading to Atahualpa this afternoon and I’m definitely looking forward to being out in the mountains! more to come….. Sorry I’ve been absent for the past few weeks with not a single update. I’ve been busy adjusting to my new life on the road, most of which has been great fun. Students are fantastic…vibrant, energetic, intelligent and hilarious. There is no doubt that I will learn quite a bit from them on this trip. Still, this is a huge adjustment to my former life in Vermont and so I’m still getting used to being with a group of people all the time compared to my quiet little studio apartment in my quiet little town. beach, in which we walked through a protected mangrove to get there. I often spotted iguanas climbing up trees, large crabs with bright orange legs crawling in and out of holes in the mud and when lucky, a family of howler monekys lounging in the trees. 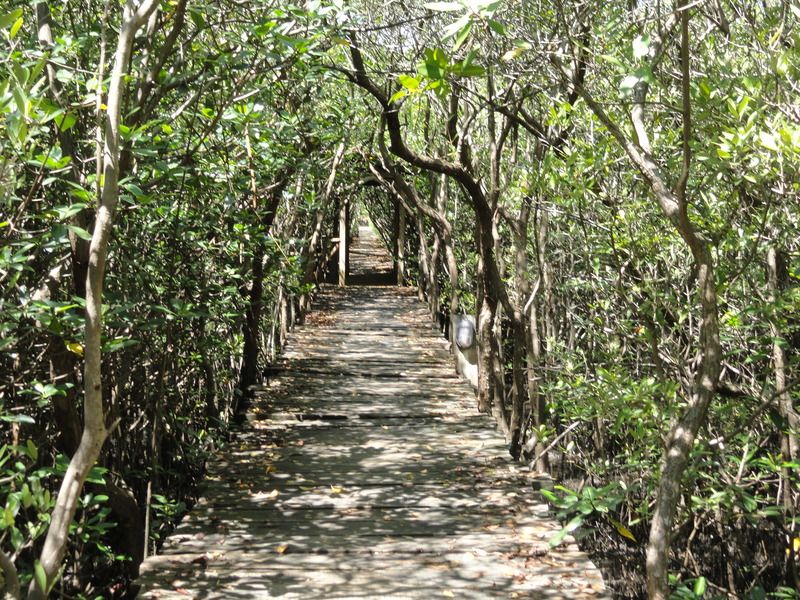 The beauty of this mangrove was that there was no development along the coast….just trees up to the beach. Definitely a rare sight these days with huge hotels and houses lining coastlines wherever possible. We enjoyed a lot of time there playing frisbee, swimming, surfing, and the rare glimpse of the sunset when it wasn’t raining. I was able to get up on the surf board a couple of times, I’m proud to report, although I’d say I more perfected the art of falling. 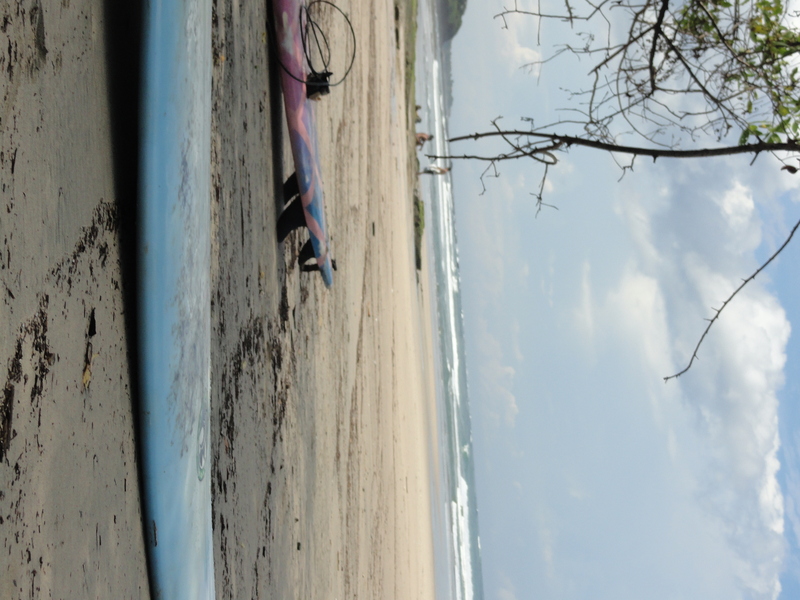 I definitely hope my dear friend Pete will take me to his place in Nicaragua some day and teach me to stay on a surfboard for more than 3 seconds! 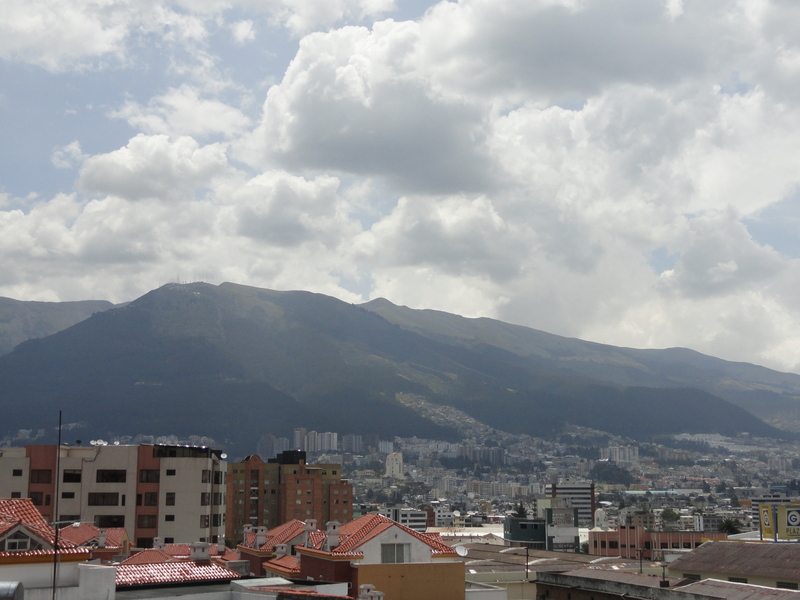 ECUADOR: I arrived in Quito, Ecuador on Friday afternoon and I can’t begin to tell you what a pleasure the change of climate is. Dry, cool air is definitely a welcomed change from the constant heat and humidity in Costa Rica. As much as I love the ocean and extremely laid back atmosphere of Avellanas, I don’t think I’m meant for such a humid climate. This is my first time in South America and first time south of the equator and I’m really excited to be here! Quito is around 9,000 feet above sea level in the Andes Mountains and for the past few days have been feeling some affects of the altitude but it’s not so bad. 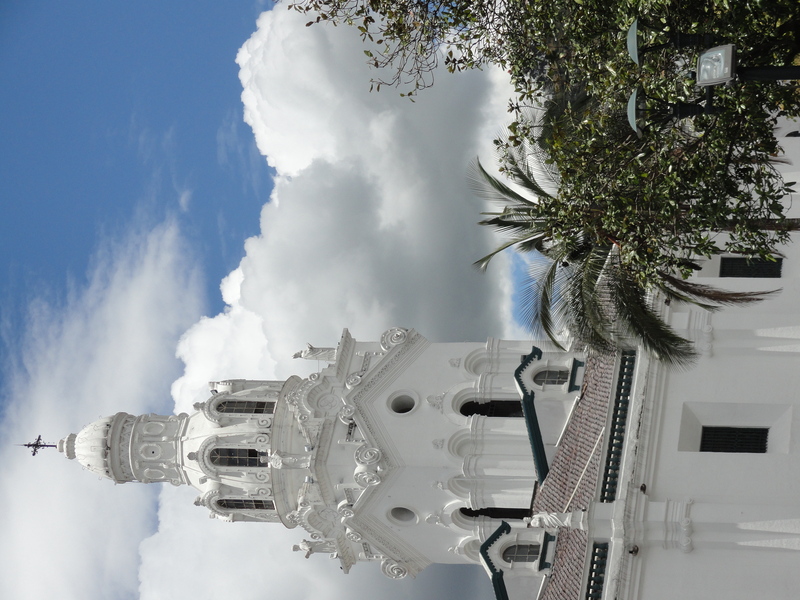 Quito is situated at the base of Pichincha Mountain which rises to the west of the city. We have a great view of the volcano from our hostel balcony. We’re staying in a Catholic mission on the east side of Quito, which also acts as a hostel. Above my bed hangs a glow in the dark rosary, which some of the students think is creepy yet I find quite humorous. I’d love to take it home to give to my friend Paula, but I don’t think that would be such a good idea. 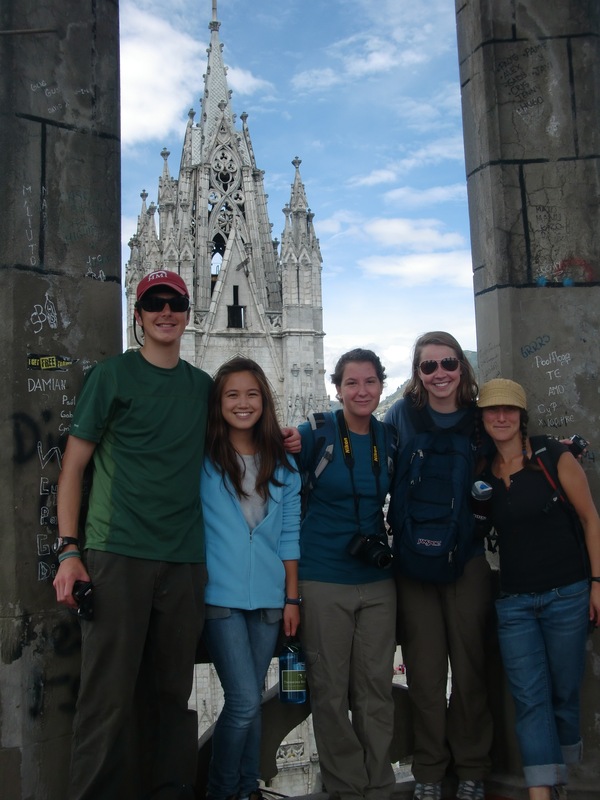 On our first night in Quito we walked as a group to a nearby restaurant. On the walk we passed by a family selling goods on the side of the street. Upon seeing us they sent their little daughter over smiling, arms outstretches with packages of gum. Most of the students said no thank you and moved on, except Tom, a sweet young man, over 6 feet tall and very into mountaineering, was stopped in his tracks. As I looked behind me to make sure all the students were together I saw Tom talking to this young girl, fishing through his pockets and handing over a dollar bill. Tom walked in shaking his head and said that he had never experienced such a thing before in his life. I quickly remembered back to when my parents took me to Mexico as a young girl and I was confronted with my own privilege at such a young age by a similar interaction. I’m struck by how easy it was for me to walk past this girl, now 25 year older, with relative ease. It’s a bit frightening how desensitized I have become. We spent part of yesterday walking around the historic Old City, exploring side streets, squares and old churches (One giant basilica we were able to climb up to the top of a steeple with a 360 degree view of the city. It had gargoyles representing animals from the Galapagos Islands like turtles and condors. I thought that was especially chevre. Another smaller more obscure church which was the first to allow Indigenous people to pray…although going in there I felt like I was imposing since it was packed with people. Beautiful church with gold paper lining the entire ceiling.) Last night, after we had the first seminar in our Environmental unit where the students explored their own environmental impact based on their daily consumption and waste, we had a viewing of a fine 80s classic film, Top Gun, since only 2 of our students had seen it. I think we may need to continue to educate our students on classic 80s films! It totally brought me back to being 10 years old in my friend Lori’s house where she made me watch the scene of Val Kilmer and Tom Cruise playing volleyball to some super cheesy music with their shirts off numerous times. But it’s not all muscles and beach, tonight we watched The Corporation. Anyway, we head out to Atahualpa, a rural Andean village with a population of about 2,000 on Wednesday where our students will begin their first work project and home stay experience. We’ll be working on an ecotourism project, helping make trails and continue our seminars on the environment and natural resources. The students are doing great and all 11 of them love being around one another. It’s as if they have known each other for much longer than 2 weeks. I feel quite lucky to be able to mentor four students, a bit of myself I see in each of them, and I’m really looking forward to being able to support and witness their growth over the next 8 months. I’ll continue to keep you posted from 10,000 ft, hopefully more frequently. I’m still getting used to blogging and am discovering new features as I go. Next time maybe I’ll post a gallery of my photos. Hope you are all doing well, enjoying the bounty and beauty of fall in Vermont or wherever this finds you. We’ve been eating these delicious vegetable soups every day for lunch and dinner which makes me think of home. If I’m not able to send out a note in the next few days, wishing my fellow Heebs a fantastic New Year! My epic journey around the world with Thinking Beyond Borders begins in less than 24 hours! Check back here regularly to see what I’m up to.